There are a couple of twists in Steve McQueen's Widows -- co-written by Gillian Flynn, author of Sharp Objects and Gone Girl -- that are so shocking they are guaranteed to make you gasp. During a screening at the Toronto International Film Festival over the weekend, I clutched my hand over my mouth multiples times. But perfectly executed beats is only one of the reasons this savvy, star-studded heist movie is going to be talked about all winter. Let's start out with some of the people -- yes, there are a few Oscar nominees and winners -- you'll see in this film: Viola Davis, Michelle Rodriguez, Liam Neeson, Colin Farrell, Robert Duvall, Brian Tyree Henry, and Daniel Kaluuya. Also, it co-stars Cynthia Erivo and Elizabeth Debicki, two women who you might not know yet, but they're so wildly talented that their ascension to familiarity will be fast after Widows gets its wide release on November 16. 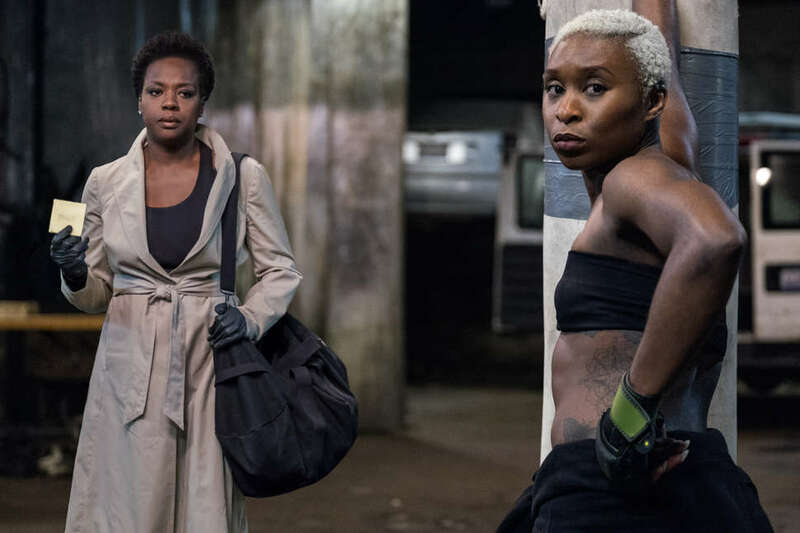 Widows is based on a British TV series from the mid-'80s, but adapted by McQueen and Flynn, it becomes a thoroughly modern American story set in Chicago. In a miraculously constructed opening sequence that bounces between heist and the intimate moments of the soon-to-be widows and their partners, we learn that Liam Neeson's Harry Rawlings is the leader of a group of robbers involved in a job gone wrong that ends in all of the men's fiery deaths and a stolen $2 million burned up. The money belonged to the local alderman candidate, Jamal Manning (Brian Tyree Henry), and his menacing henchman (Daniel Kaluuya), who track down Harry's wife, Veronica (Viola Davis), to collect their missing funds. Veronica is an employee for the teacher's union living an immaculately curated life on Lakeshore Drive. An adorable West Highland terrier is constantly by her side in her pristine apartment. This pooch serves an important purpose as the plot unfolds. Harry left behind a notebook extensively detailing a plan for his next job, and, determined to complete it herself, Veronica seeks out the women who are equally invested in securing money: the widows of the other victims, each of whom have their own struggles to overcome in the wake of the accident. Linda's (Michelle Rodriguez) store was taken away; Alice (Elizabeth Debicki) has never provided for herself. If you're familiar with Flynn's work, you know not to expect uncomplicated female solidarity, and once again, she delivers here. Despite the widows' common goal, they are not chummy. They are bound solely by need, so there's a grimness to their mission. All this is unfolding in tandem with drama involving Jamal Manning and his opponent for the seat in his predominantly black neighborhood, a political scion played by Colin Farrell, who runs in the shadow of his father (Robert Duvall). How this election is related to Veronica's aims is methodically revealed. But what seems like potentially extraneous information is crucial to how McQueen crafts this tale of lives built on power and crime. It's almost difficult to single out any performance since everyone is matching each other on a bar set incredibly high. Davis has an intense determination and a buried sorrow that isolates Veronica from the rest of her crew, but makes her a fascinating character study. Kaluuya is terrifying as can be as a sadistic, skull-cracking sidekick. Debicki, in some ways, gets the biggest arc as a person who learns her own worth outside of her relationship to men. Farrell and Duvall go toe-to-toe in a viciously funny fashion. Widows -- despite its moments of blood-pumping action -- rewards patience, managing to be a ridiculously entertaining and complex web of a heist movie.